This painting project is based on artist Laurel Burch, whose artwork is filled with bright colors and wild patterns. 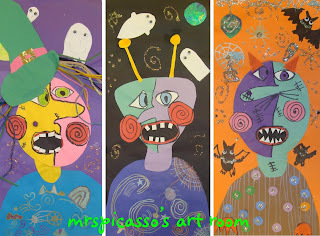 Students drew their cats on 18" X 24" colored construction paper and painted them using tempera. When dry, they were outlined using a silver Sharpie marker, cut out, and glued on to a background made of wrapping paper (which was glued to a poster board). This would be a great way to use up rolls of wallpaper, as well. We had several positive comments on this project and it was quick and easy. 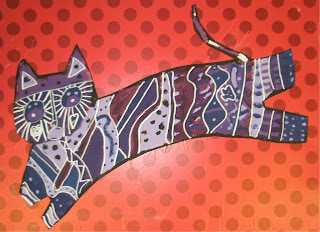 See the entire menagerie of Fantastic Felines in our Artsonia gallery. 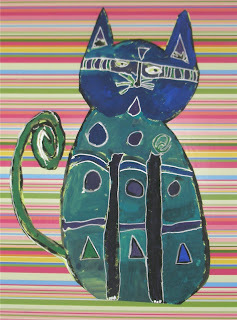 I think these are the best representations of Laurel Burch's cats I've ever seen! They are so dynamic. Love the wrapping paper background. I would love to try these with my students. These are fantastic! I also love the graphic wrapping paper backgrounds.